While many people dread wearing metal braces, many patients are excited about the prospect of wearing Invisalign invisible braces. It is a popular orthodontic treatment that dentists believe can help a significant portion of patients who have relatively minor orthodontic problems. It is a treatment that’s available at Alexandria Smiles Dentistry in Alexandria, VA. Almost everyone wants a perfect, straight and beautiful smile. In fact, A Kelton Global survey discovered that the most positive first impressions occur due to an attractive set of teeth. 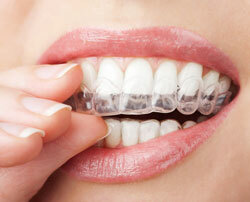 With Invisalign, crooked or misaligned teeth are straightened using clear plastic trays instead of metal devices. Invisible aligners are as effective as braces in repositioning the teeth to improve the appearance of your smile. Invisalign aligner trays are designed to gently force your teeth to conform to their shape over a specific period of time—usually six to 12 months. Once the first tray does its job, it’s time to wear the next one—this process continues every two weeks or so. After your Alexandria dentist confirms that the treatment is complete, you’ll use the final aligner tray as your retainer every night while sleeping. To start the process of getting a nicer, straighter smile, call Selena L. Marchan, DMD, PA at (904) 221-5678 and ask about Invisalign. The goal is to give each patient a comprehensive experience, ensuring that they have beautiful, healthy teeth for a lifetime. Are you interested in a beautifully straight smile? Call our Jacksonville, FL office at (904) 221-5678 to learn more today!